RGBW LED strip with 360 LED's, specially manufactured to our specifications. This LED ribbon light combines RGB color and separate dedicated neutral white LED's (4000K) on one strip. The extra neutral white LED's on this LED strip produces proper white light, something a standard RGB strip isn't capable of. The mix of neutral white and RGB color gives this RGB+W LED strip a much broader color spectrum and allows wonderful color combination possibilities. This versatile RGBW strip contains A-quality LEDs and leaves many other RGBW LED strips behind with its long life span, bright SMD 5050 RGB / WW LEDs and the use of high quality components. 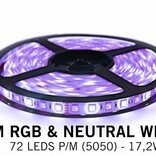 This RGBW LED strip with 72LED per meter (36 warm white, 36 color) has a length of 5 meters. 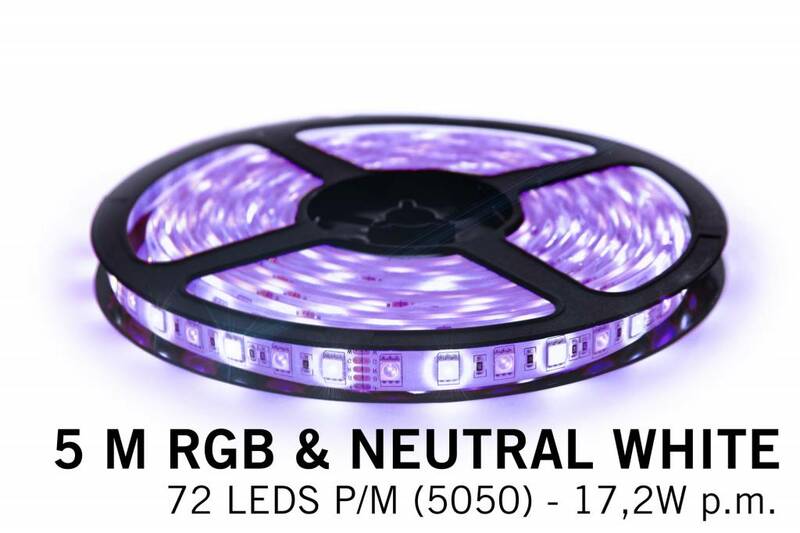 This type RGBW LED strip is also available in 300 LEDs / 60 LEDs p.m!